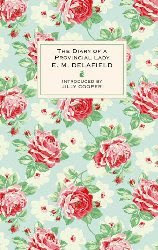 Back in May I treated myself to a lovely copy of The Diary of a Provincial Lady by E.M. Delafield. I bought it partly because I'd seen the book mentioned on several blogs I visit every day but also... well I just fell in love with this lovely cover design by Cath Kidston. It is, in fact, one of eight special edition, Virago modern classics and because it was my birthday back then, I decided to treat myself. Well then, I'm pleased to report that this book did not disappoint. I'd heard it was wonderfully funny in a droll kind of way and it absolutely *is*. I cackled my way from start to finish and then went back and read Jilly Cooper's excellent introduction. (I never read introductions before the book as I feel they give away too much.) E.M. Delafield actually lived in Cullompton which is only a few miles from here and you very much get the feel of Devon village life as it used to be lived and, to a certain extent, still is, though Cullompton is surely bigger and busier now than it was between the wars. She was only 53 when she died and is one those authors who was immensely popular but fell out of fashion and was mainly forgotten. The 'Diary' seems to have brought her back to people's attention though and I'm curious enough to search out other works by her if they're still in print. Recommend this to anyone who enjoys a gentle but very amusing read. Joyous. Joanne Harris is not exactly a new author to me, I've heard of her, seen the film Chocolat etc. but not read any of her books. Why? I'm not sure really. I liked the movie of Chocolat well enough, just didn't feel inspired to rush out and read the book or any of the other food inspired books by the same author, set in France. So why, when I spotted Gentlemen and Players in a charity shop, did I decide to buy it? Well, it sounded different to her usual fare and I was intrigued - it was as simple as that really. It's quite a difficult book to describe without giving away spoilers. The setting is a small English public school for boys known as St. Oswalds. There are two first person narrators and two timelines. The first timeline begins as the school gets a new caretaker who takes up residence in the lodge with his only child, nine years old, and known to us as 'Snyde'. Snyde begins to explore the lodge's surroundings and, eventually, to trepass in the school grounds and then gets to know the inside of the school like the back of his hand. Unhappily attending a local comprehensive, it eventually becomes Snyde's dream and obsession to attend St. Oswalds. A uniform is stolen, and with a thorough knowledge of the school to help, Snyde slowly but surely becomes a St. Oswald's boy by bunking off school or going sick at various times. It's when Snyde, aged eleven, meets Leon Mitchell in the corridors of St. Oswalds that things take a more sinister turn. Leon is a couple of years older, much more worldy-wise, a beautiful boy in fact. Snyde falls hopelessly in love. The second timeline, woven in with the first, is fifteen years later. We're told that Snyde has joined the staff of St. Oswalds but there are four or five new members of staff this September and we're not told which Snyde is. Something terrible happened fifteen years ago and Snyde, in disguise with a new identity, is out for revenge. We meet many of the members of staff that were familiar to Snyde back then, in particular Roy Straitly, close to retirement, head of classics, but sensing that Latin is now a subject looked upon as old-fashioned by the rest of the staff and that his head-master is trying to pension him off. Slowly but surely things start to go wrong at the school. Articles go missing, computers get viruses and show images they shouldn't and then a boy, allergic to peanuts, nearly dies when a peanut is dropped into his can of fizzy drink. He's one of Roy Straitly's 'boys', as was a certain Leon Mitchell, and Roy is very protective of his class members and remembers each and every one he's taught. Something is very wrong at St. Oswalds and eventually it dawns on Roy that someone is trying to bring the school down. But who? Pageturner. Pure and simple. Absolutely unputdownable. Read it. I suppose I should say more. ;-) I didn't know I had a taste for this kind of psychological crime yarn. It was like watching a train crash in slow motion as the author slowly reveals a bit more and a bit more and you get more and more involved with the characters and their motives. There's a huge secret which I partly cottoned onto about halfway through but not the 'whys' or the 'wherefores' and my enjoyment wasn't spoilt at all by that. Harris creates a wonderfully insular setting. You can almost feel St. Oswalds, smell it, know it, love it as Snyde did. The school is really a third main character and because of that you can almost understand and empathise with what Snyde does. I'm not a serious crime reader in any way, shape, or fashion so this must have been a bit special to hook me the way it did. It was. Read it. It's my first anniversary today! One year since I decided to start a second bookblog on Blogspot (my other is on Live Journal) after umming and ahhing about it for months. I wouldn't have missed it for the world, I've met such lovely people and now treat this as my main bookblog rather than a secondary one. The other thing of note to mention is that this is my 100th. post. I'm not sure whether 100 posts in exactly one year is good or bad but it's quite coincidental that they happened on the same day! Anyhow, the book I've just finished is very worthy of this most auspicious moment - it's The Camel Bookmobile by Masha Hamilton. I first read about this book here on Robin's blog. It sounded like my kind of book and I was lucky enough to get a copy via the Devon library catalogue. Fi is an American librarian who isn't ready to settle down yet - is not, in fact, sure that she ever will be. So she applies for a job in Africa, part of which turns out to be taking books to outlying, remote villages in the African bush. The mode of transport is Siti, a rather ornery camel, and with Fi goes Mr. Abasi, a librarian who is not as keen on spreading the word about reading as he might be and who thinks the camel is possessed by the spirit of his dead mother. The main story takes place in a village known as Mididima; the tribe living there is nomadic but settled for the moment. The people there are split about whether the books that arrive once a fortnight are a good thing or a bad thing. The elders are afraid their way of life is threatened by too much knowledge of the outside world. Others feel the village needs to be more forward thinking. We meet Matani, the school teacher, and his straying wife, Jwahir; Neema and her grandaughter, Kanika, who wants to leave the village to become a teacher in the city - and Abayomi and his two sons one of whom is known as 'Scar Boy' because of an horrific attack by a hyaena when he was a toddler. It's for little gems like this that I religiously read other people's blogs. I would never have known about this if I hadn't seen it on Robin's blog and that would have been a terrible shame as it is delightful. The atmosphere reminded me a bit of Alexander McCall Smith's Ladies' Detective Agency books, set in Botswana. I don't think the country is ever mentioned here but there is, apparently, a Camel Bookmobile in operation in Kenya. And, although this does seem at times like a bit of a cosy read, it actually isn't. There are some valid points to be made about the effect of western civilisation upon indigenous tribes and about the role of women in these tribes in the 21st. century. And the answer to the question, 'Are books necessarily a wonderful thing?' is not as cut and dried as you might think. The unexpected ending brought a real lump to my throat and I applaud the author for not going the obvious route. A gorgeous, thought provoking read. Three short reviews from me today. If I can remember how to do short. ;-) These were all quick, enjoyable reads from the last week or so. Sometimes that's all you want - quick, enjoyable, undemanding. A poor picture - annoyingly I couldn't find a better one of my copy of Sorcery and Cecilia by Patricia Wrede and Caroline Stevermer. Whatever, the story concerns two cousins, Cecilia and Kate, who have been separated temporarily, the latter to enjoy a season in Regency London and the former forced to stay at home. The two corresspond and each get embroiled in various magical shenanigans with wizards both male and female. It soon becomes clear that both are involved in the same adventure. I first heard about this book from Deslily and am very pleased I managed to find it in a charity shop for 50p! It's a fun Regency romp, written in letter form, apparently as a result of a Letter Game the two authors played one year. There are two sequels and I'm pretty certain I'll be reading both at some stage. The third and final book in the YA Hollow Kingdom trilogy, In the Coils of the Snake by Clare B. Dunkle. Marak the Goblin King who featured mainly in the first book is at the end of his life. He has nurtured and mentored a human girl, Miranda, to be the next wife of a Goblin king, his son, and brought her to live in his underground kingdom. After Marak's death Miranda becomes the fiance of the new king, Marak Catspaw, but a new Elf lord, Nir, suddenly appears offering the king an elf bride. He has no choice but to agree and the elf-bride takes Miranda's place. Devastated, Miranda leaves the kingdom only to find herself kidnapped by Nir and taken to live with the elves. The plot of this one is convoluted but, as with the other two books, great fun and unputdownable. I don't know why Clare Dunkle is not better known than she is. Until recently she didn't even have an entry on Fantastic Fiction, an oversight which has now been remedied I notice. Anyway, sad to have finished this trilogy but there you go, I'm sure I'll be rereading at some stage. Joe and Kerry are shipped off to stay with their great-aunt in deepest Wales in The Weather Witch by Paul Stewart. They live in London and their mother is afraid they'll get into all kinds of trouble if left alone in the city over the summer holidays. Great Aunt Eleanor is a bit of a character and regales them with the story of the Elizabethan village that disappeared overnight, four hundred years ago. The children explore Eleanor's huge house and have a haunting experience and then they discover the lake which is when things *really* start to happen. Another fun read... aimed at children aged about 12 to 15 I'd say. It's pacey and creepy, with unusual ideas and a nice sense of history as well. Paul Stewart is co-author of the well known 'Edge' Chronicles for younger children but this is one his forays into fiction for older children. I liked it. Inspired by Robin at A Fondness for Reading I've decided on a new long-term challenge at last. It's The Book Awards Reading Challenge and it's being hosted by Michelle at 1more chapter.com. 4. You don't have to post your choices right away, and your list can change at any time. 5. 'Award winners' is loosely defined; make the challenge fit your needs, keeping in mind Rule #2. So that's it. It'll be interesting to see how far I get with this as it's quite a challenge, but I feel like I'm really up for it. Well, the Heart of a Child challenge, hosted by Becky, is almost over. The challenge was to read 3 to 6 books that you loved as a child, from the 1st. February to the 14th. July. I've now read 4 so am considering the challenge completed. My 4th. 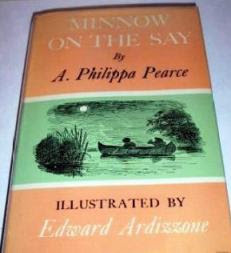 and final book is Minnow on the Say by Philippa Pearce, a favourite library book of mine when I was child living in Penzance, in Cornwall. First of all I'll confess that this is not a photo of my book, it's one I found on the internet. My own copy is a lot rattier than this one. Secondly I'll confess that I fell totally in love with this book all over again. The plot is a fairly typical one of its time - the mid 1950s - where two children are searching for a treasure that will stop a house having to be sold and save a family from poverty. The children in question are David Moss, an ordinary boy from an ordinary background whose father drives a bus, and Adam Codling who lives in huge house, but in upper-class poverty. David wakes up one morning, after a bad storm, to find a canoe floating on the river at the bottom of his garden. The river is the river Say and David, hoping to keep the boat, names it the Minnow. A day or two later he ventures upstream looking for a broken stump that might match the bit attached to the canoe, and meets Adam Codling. After some misunderstanding the two boys become friends and Adam tells David something of the history of his family and about a treasure that was lost back in the 16th century. Adam lives with his aunt Dinah and his grandfather, who fell into dementia when his son (Adam's father) was lost in the war. The family are very poor, to the point where there's hardly any furniture in the house and not enough to eat - so much so that Dinah believes she can no longer keep Adam with them and he'll have to go and live with cousins in Birmingham. Adam believes if he can only find the lost treasure he can save their little family and he won't have to go and live in Birmingham. All they have to go on is a rhyme left behind as a clue and, using The Minnow, the two boys spend their summer holidays desperately searching for the treasure. Talk about nostalgia. This, of course, is what childhoods used to be like. 1950s and 60s style, that is. I don't know when things changed, my own girls were born in the mid-70s and, although they had a certain amount of freedom, mothers already felt it wasn't as safe as it used to be. I personally roamed all over the Cornish countryside as a child, in fields, in woods, in the local stream and, when slightly older, on the beaches. Idyllic, I suppose you'd describe it as. Even though we had little money, it didn't matter because no one else did either! No one went away on holiday. If someone had announced they were off to Majorca for a week the reaction would have been stunned disbelief. If people went anywhere it was usually to stay with relatives who might live in another part of the country. And thus, school holidays were spent as David and Adam spent their's, exploring and enjoying the local countryside. This book took me right back to that and also to a time when there was less stress, where people took the time to bake cakes or grow their own veg. and thought it was *normal* to do so. Philippa Pearce's writing is superb. I didn't realise it but this was her very first book. She's more famous for Tom's Midnight Garden, which I haven't read, plus she was quite a prolific writer of children's books until her death in 2006. What a wonderful debut this was! I know I read Minnow on the Say several times, adoring its lazy English summer atmosphere and the excitement of the search for the treasure. Now I can see more in it of course. The fact that she has 11 and 12 year old boys spot on in their gruffness and unwillingness to explain what they mean when dealing with each other. I'm now more struck by the sadness of dementia and by the aunt not having enough money to feed Adam, a growing boy, who is consequently always hungry. David's parents quickly realise this of course and do their best to help. Despite the fact that they were working class they were actually better off than their upper-class counterparts. Things were clearly changing in the 1950s. I can't recommend this book too highly and I mustn't finish without mentioning the lovely illustrations by Edward Ardizzone. They fit the book perfectly and are mini works of art in themselves. A gorgeous, atmospheric, *summer* read. So, that concludes my reading for the Heart of a Child challenge. And I can say without a word of a lie that I loved them all just as much as I did when reading them as a child. Thanks to Becky for hosting this delightful challenge. G.K. Chesterton's writing is simply taking my breath away. I'm reading an anthology of his Father Brown stories, taken from several books, and I'm reading it slowly over several months so that I can really take in what I'm reading. This wonderfully atmospheric introduction comes from a short story called The Sign of the Broken Sword. Chesterton goes on to describe how Father Brown and an investigating friend, Flambeau, are taking a night-time walk, first to the church-yard to look at a war memorial and then on, through the forest, to the inn. And all the time Father Brown is relating the story of a local land-owning war-hero who had apparently distinguished himself at a particular battle in Brazil and, supposedly, died a hero. But gradually the priest reveals via various snippets of information in his own inimitable style and we realise that all is not as it seems and the truth of the matter is, in fact, truly horrible. The story is available to read online here, along with the rest of the stories from The Innocence of Father Brown (my book actually only has seven stories from this anthology). Chesterton does dark, brooding atmosphere very well and - a surprise to me - humour. Dry humour. I should've known this but didn't as I've never read any of his other novels and certainly not tried Father Brown, no matter how many people told me I should! I'm getting a lot better at heeding bookish advice these days - I was a fool to myself once upon a time and rarely took any notice. Not any more. I can no longer state that I never win anything either. I'm not sure whether to be happy about this, or sad, as us Brits love to have something to mutter and moan about. ;-) But the fact is I've just won two free books! The first is The Book of Love by Sarah Bower and that comes courtesy of Elaine at Random Jottings and the book's publisher. The second is The Savage Garden by Mark Mills and this one is courtesy of Danielle at A Work in Progress and *that* book's publisher. Thank you both for holding the book draw, I'm thrilled to bits to have won something at last!